Items 134- out of displayed. E-mini S&P500 moved has turned slightly down since start of the month so looks like that new corrective reversal is in play. Based on substructure up since end of February we believe that current set-back is fourth wave of an impulsive recovery. Normally fourth waves will retrace back to the area of a former wave four which comes in near 2010. At the same time we need to keep an eye on 38.2% which is the most important Fibonacci level when it comes to predicting the end of fourth wave pullbacks. That said, further weakness to around 2000-2010 should not surprise us before market turns up for a wave 5). 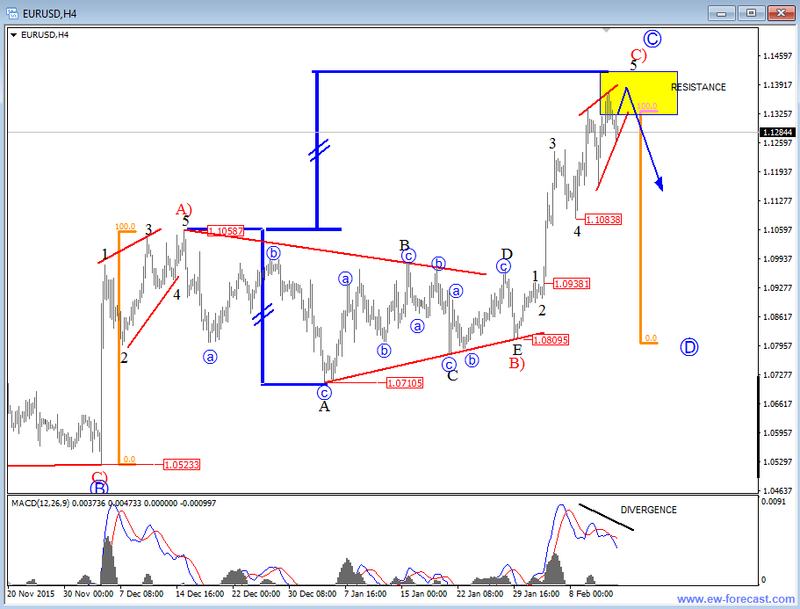 A sharp bounce above 1.1300 last week suggests that bulls can take EURUSD to higher levels and that big wave C within ongoing triangle is still in play. We see price currently trading around 1.1400 area so obviously leg up since March 10th is more complex and bigger. We see it as a zigzag that belongs to complex correction in blue wave C-circled that can stop at 1.1450-1.1500 area this week, where we would look for a bearish turn. Bearish cross and divergence on MACD also suggests that upside is limited. 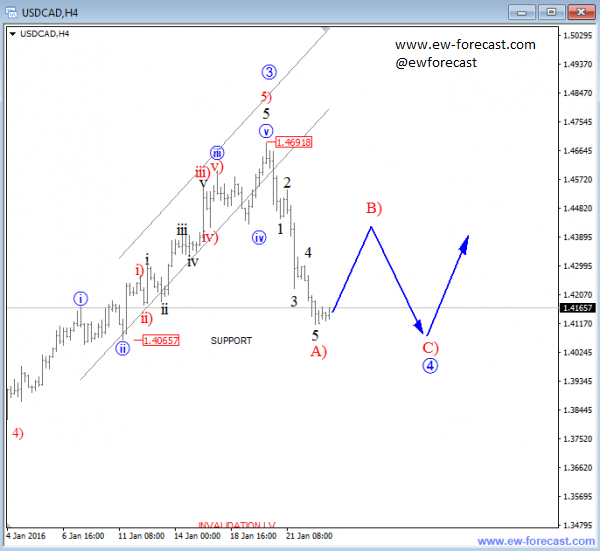 A new high on GBPUSD makes rally from 1.3835 in five waves. And we know what that means right? It means that temporary lows are in place and that cable will most-likely recover much more in the rest of the month with a new big wave four in progress. 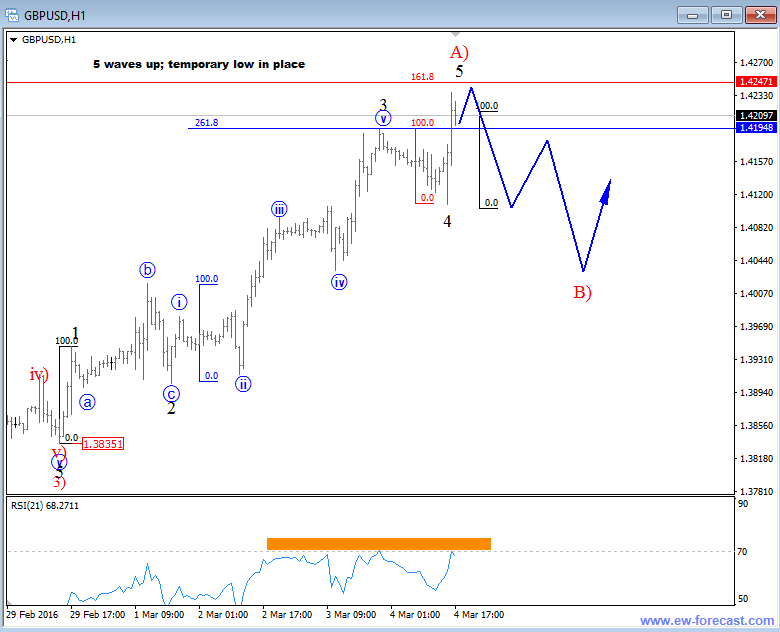 However, as always there will be pullbacks, and looks like that new one can be around the corner as subwave 5 is trading at some Fibonacci resistance area at 1.4220-1.4250. 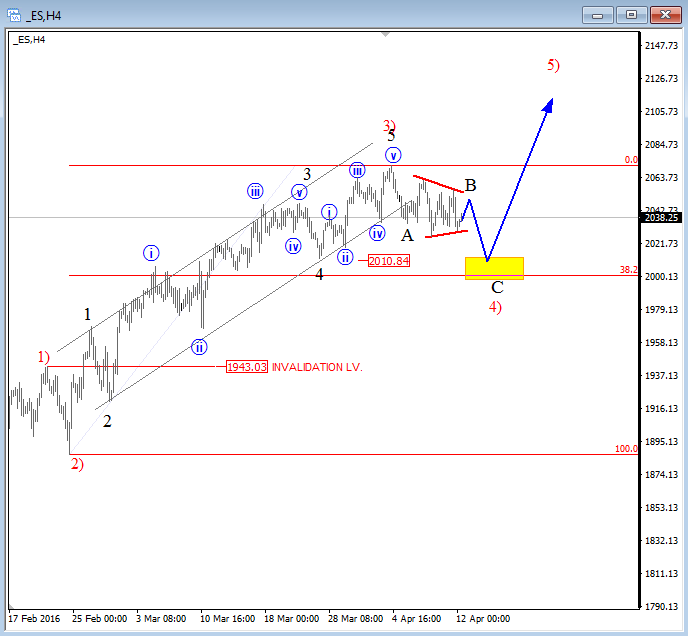 We will look for a three wave of retracement next week which can be nice structure to join the bullish run. EURUSD pair broke sharply to the upside recently which has been technically expected after a completed triangle at 1.0810 area. As such, current leg is an impulse, ideally wave C) of (C) which may face limited upside soon. Keep in mind that whole rally since December is still a three wave move now at equality level. So ideally move is corrective that represents big wave C-circled within ongoing triangle formation shown on daily chart. We suspect that price can turn down from 1.1350-1.1400 resistance area. An impulse down back to 1.1080 will put highs in place. Traders, I want to let you that we won the first place; we got an award for Best Analysis on FXStreet.com. I really want to say thank you to everyone who voted for us and that we really appreciate your support over the last few years. I wish you many good trades in 2016! 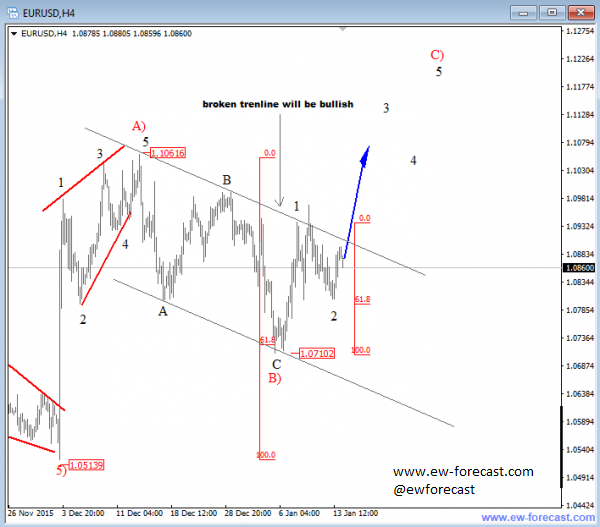 USDCAD reached new highs around 1.4700 last week where bears stept in and caused a strong bearish turn. Notice that move was sharp and it also extended much lower on Friday, which is an important evidence for a top in place as there was a bearish weekly candlestick formation. But it can be only temporary top if we consider that decline can unfold only in three legs that would represents then a wave four. However, no matter where the pair is headed long-term, for the short-term swings there is room for more downside in sessions and days ahead. Notice that current leg down is wave A, so more weakness to come after wave B rally. EURUSD has turned up last week, away from 61.8% Fibonacci support which was a key support for this pair it seems as price jumped more than 200 pips so far. So a decline from 1.1060 high was in three waves, which is a corrective move called a zigzag that is now pointing to higher levels. We are anticipating higher prices for a red wave C) that will be confirmed when pair will break and close above the upper channel resistance line. In that case pair should continue higher through the rest of the month, up to 1.1200.